The System x3250 M4 single-socket 1U rack server is designed for small businesses and first-time server buyers looking for a solution to improve business efficiency. It delivers several innovative features in a compact 1U form factor with a competitive price. This product guide provides essential pre-sales information to understand the x3250 M4 server, its key features and specifications, components and options, and configuration guidelines. This guide is intended for technical specialists, sales specialists, sales engineers, IT architects, and other IT professionals who want to learn more about the x3250 M4 and consider its use in IT solutions. Withdrawn from marketing: This server is now withdrawn from marketing. The replacement server is the Lenovo System x3250 M5. See http://lenovopress.com/tips1050. The System x3250 M4 single-socket 1U rack server is designed for small businesses and first-time server buyers looking for a solution to improve business efficiency. It delivers several innovative features in a compact 1U form factor with a competitive price. The System x3250 M4 provides next-generation performance in an innovative and compact design with flexible configuration options, built-in security, and systems management capabilities. This server is designed for infrastructure applications such as firewall, security, disaster recovery, name server, authentication, credit card processing, email, domain controller, and more. It leverages the next-generation dual-core and quad-core Intel Xeon processor technology. Suggested uses: Small-to-medium businesses looking for file and printer servers, Web serving, and small business infrastructure. The System x3250 M4 server is a compact, cost-effective, single-processor 1U rack server that has been optimized to provide outstanding availability, manageability, and performance features to small-to-medium-sized businesses, retail stores, or distributed enterprises. It supports the latest Intel Xeon E3-1200 v2 family of processors (formerly codenamed "Ivy Bridge") for applications that require performance and stability, and Core i3 processors for applications that require lower cost. The system includes features not typically seen in this class of system, such as standard RAID-0/1 for simple-swap SATA models, remote control capabilities even when the machine is powered off, and Predictive Failure Analysis (PFA) on processor and memory. This flexible 1U rack-mountable server is also highly upgradable and expandable, scaling from low-cost, fixed-function models to feature-rich, highly available models. Often small-to-medium sized businesses (SMBs) have limited IT budget and resources, and rely on partners or multitalented employees to help manage the company’s network. Business needs for efficiency improvement and retention of critical data require the use of a server that is easy to get up and running quickly and is dependable. You need to squeeze as much as possible out of your IT dollars, while saving cost on features not needed in an SMB environment. The System x3250 M4 is an ideal first server to meet those business needs. It was built for speed, yet eliminates costly design features found in general-purpose servers that are unnecessary for smaller businesses. The single-socket x3250 M4 supports the new quad-core Intel Xeon Processor E3-1200 v2 family of processors ("Ivy Bridge") in a compact 1U rack design. Two available high-performance PCI Express expansion slots, one PCIe 3.0 slot and one PCIe 2.0 slot. Two internal 3.5-inch simple-swap SATA II drive bays or four 2.5" hot-swap SAS/SATA drive bays (model dependent) offer low-cost/high-capacity enterprise-class storage. Up to 8TB of internal storage. Configurations with four 2.5" simple-swap drive bays available via CTO. Integrated ServeRAID C100 software RAID controller supports RAID 0, 1 and 10. Some models offer ServeRAID BR10il V2 or H1110 hardware RAID controller standard. Other hardware RAID options available. An optional optical drive for installing software or backing up data. Hot-swap drives supported on some models enable failed disk drives to be replaced without powering off the server. Hot-swap redundant power supplies available on some models maximizes system uptime even when one power supply fails. Built-in Integrated Management Module II (IMM2) with optional upgrade to Standard and Advanced levels, continuously monitors system parameters, triggers alerts, and performs recovering actions in case of failures to minimize downtime. The server includes an Integrated Management Module II (IMM2) to monitor server availability and, with IMM feature upgrades, perform remote management. 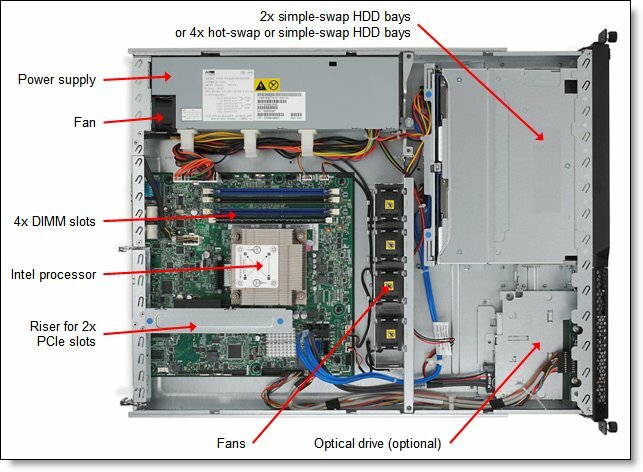 Figure 2 shows the front of the server with two 3.5-inch simple-swap drives. Some models have up to four 2.5-inch hot-swap drive bays. Processor One quad-core Intel Xeon E3-1200 or Xeon E3-1200 v2 series processor (up to 3.6 GHz/8 MB/1600 MHz) or one dual-core Intel Core i3 2100 series processor (up to 3.4 GHz/3 MB) with up to 1333 MHz memory speed. Supports specific quad-core and dual-core processors via Configure-To-Order (CTO). Memory cache Up to 8 MB L3 for Intel Xeon E3-1200 and E3-1200 v2 processors. Up to 3 MB L3 for Intel Core i3 2100 series processors. Memory DIMM slots 4 DIMM slots supporting UDIMMs. RDIMMs are not supported. Memory capacity Up to 32 GB with four 8 GB DDR3 UDIMMs. Maximum internal storage Up to 8 TB with 4 TB SATA HDDs, or up to 4.8 TB with 1.2 TB SAS HDDs. Up to 6.4 TB with 1.6 TB SSDs. Intermix of SAS/SATA is not supported. RAID Support Software RAID 0, 1 with ServeRAID C100 controller. Some models with hardware RAID 0, 1, 1E with ServeRAID-BR10il v2 or H1110. Optional RAID 5 with ServeRAID M1015. Optional RAID 5, 50 with ServeRAID M5014 and M5015. Optical drive bays One, support for optional DVD-ROM or multiburner. Network interfaces Integrated two-port Gigabit Ethernet using Intel 82574L controller. One port is shared with IMM2. Cooling Calibrated Vectored Cooling™ with 4 fans and N+1 redundancy. Systems management UEFI, Integrated Management Module II (IMM2), Predictive Failure Analysis, Automatic Server Restart, IBM Systems Director and IBM Systems Director Active Energy Manager™, ServerGuide. Limited warranty Three-year (2583) customer-replaceable unit and onsite limited warranty with 9x5/next-business-day (NBD) response time. The following table lists the Express models that are available in certain regions. Express models are preconfigured with additional components such as processors, memory, and disks with the purpose of making the ordering and installation process simpler. The server supports only one processor, which is already installed in all standard and Express models. No additional processor options are available. The following table lists all processors available in standard models of x3250 M4 or via CTO. If there is no corresponding where-used model for a particular processor, then that processor is only available through the configure-to-order (CTO) process. * No additional processor options are available. The server supports only one processor, which is already included in a standard, CTO or special bid configuration. The server has four DIMM slots, and only DDR3 ECC UDIMMs are supported. The CPU has two memory channels, and there are two DIMMs per channel. The following table lists the hard drive options available for internal disk storage in the x3250 M4 server. Intermixing SAS and SATA drives is not supported. The following table lists the RAID controllers, SAS HBAs, and additional options used for internal disk storage of x3250 M4 server. The ServeRAID BR10il v2 or H1110 is standard on some models and offers basic hardware-based RAID functionality. If either of these is used, it is installed in slot 1 (PCIe x4). Other RAID controllers are installed in slot 2 (PCIe x8) and the Broadcom NetXtreme Dual Port Ethernet Compact Adapter can be installed in slot 1 instead, if desired. Only one RAID controller can be used with the server to support internal HDDs. 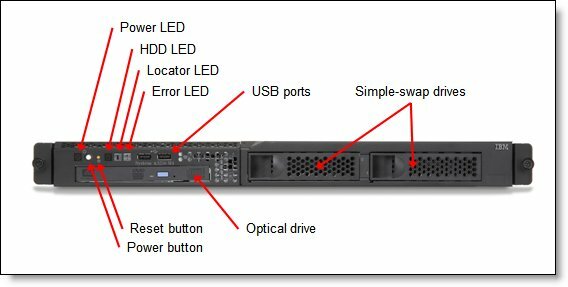 Features of the supported RAID controllers are discussed below. Note: Either a ServeRAID BR10il v2, H1110, M1015, M5014, or M5015 is required for models with 2.5" simple-swap SAS drive bays or 2.5" hot-swap SAS drive bays. The x3250 M4 offers two integrated Gigabit Ethernet ports. One port is shared with Integrated Management Module (IMM). Note: TCP Offload Engine (TOE) is not supported by the Broadcom NetXtreme Dual Port Ethernet Compact Adapter. The following table lists additional supported network adapters. All adapters are supported only in Slot 2 with the exception of the Broadcom NetXtreme Dual Port Ethernet Compact Adapter which is installed in Slot 1. The following table lists the storage host bus adapters (HBAs) supported by x3250 M4 server. Some models include one fixed 300 W AC 80 PLUS-certified power supply. This 300 W unit cannot be upgraded. Some models include one 460W hot-swap power supply. With the addition of a second power supply, the two form a redundant pair. The following table lists the option for the second power supply. Both the 300W and 460W power supply units support maximum configurations and support auto restart that minimizes operator intervention after a temporary power outage. One 2.8-m C13 - C14 power cord is shipped for each included power supply. The server contains Integrated Management Module II (IMM2), which provides advanced service-processor control, monitoring, and an alerting function. If an environmental condition exceeds a threshold or if a system component fails, the IMM2 lights LEDs to help you diagnose the problem, records the error in the event log, and alerts you to the problem. The server includes IMM2 Basic and can be upgraded to IMM2 Standard and IMM2 Advanced with Feature on Demand (FoD) licenses, however, you may need to upgrade system firmware to the latest levels (at least level 28n) to support these upgrades. The System x3250 M4 has a 3-year onsite warranty with 9x5/next-business-day terms. Lenovo offers warranty service upgrades through ServicePacs. The ServicePac is a series of prepackaged warranty maintenance upgrades and post-warranty maintenance agreements with a well-defined scope of services, including service hours, response time, term of service, and service agreement terms and conditions.